At 2,250 feet Painted Wall is the tallest cliff in Colorado. If you look closely enough you can see two dragons, one above the other. The pinkish color rock that forms the dragons is called pegmatite. 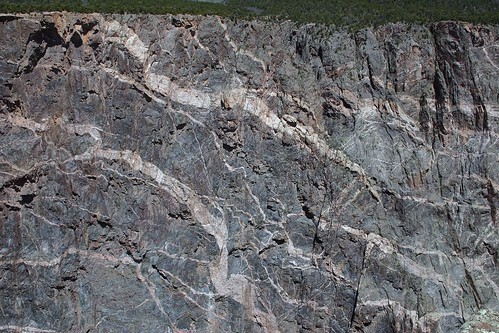 The pegmatite was originally magma that was squeezed into the other layers of rock (schist and gneiss) that form the canyon walls. This entry was posted on April 21, 2008 at 9:20 am and filed under Black Canyon of the Gunnison, Black Canyon of the Gunnison National Park, canyon, cliff, Colorado, National Park, Painted Wall, pegmatite, vacation.